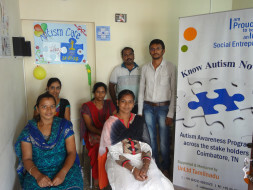 Hello everyone, I am Nachiappan, a proud Social Entrepreneur hailing from southern part India residing at Coimbatore,TamilNadu.I am a Social Worker by Profession working in the field of Autism Spectrum Disorder for the last 3 yrs. My project "KNOW AUTISM NOW!" is a full fledged awareness programme about 'Autism and its importance of early identification' among the primary stakeholders across Coimbatore district(i.e. nursery and primary school teachers, future teachers and primary health centre's General physicians).As the awareness level of this highly prevalent childhood disorder is less we are initiating a mass campaign to alert people and guide them to direct the beneficiary on the right path in terms of diagnosis and intervention. We are sure of our work as we have a good track record in dealing with Children with Autism.I run my Early Intervention centre for children with ASD under the banner of " Autism Care" @vadavalli,Coimbatore. It turned 1 now! Thanks a lot for creating such a awareness among the people in Coimbatore. You are doing a great service to humanity. May god be with you in all your future endeavors.